Evoking comparisons to The Help, The Secret Life of Bees and Fried Green Tomatoes this is a powerful and unforgettable story of two courageous women brought together in 1950s Mississippi by one extraordinary little girl. Hussey's storytelling is engaging, and her voice is fresh and authentic. In delicate strokes, she explores the profound bond between mothers and daughters, the yearning for absent husbands and fathers and how an unlikely friendship can transcend even the deepest social injustices. In 1945 Betty Jewel Hughes was the hottest black jazz singer in Memphis. But when she finds herself pregnant and alone, she gives up her dream of being a star to raise her daughter, Billie, in Shakerag, Mississippi. Ten years later, in 1955, she is dying and looking for someone to take care of Billie when she's gone. With no one she can count on, Betty Jewel does the unthinkable " she takes out a want ad seeking a loving mother for her daughter. On the other side of town, recently widowed Cassie Malone is an outspoken housewife insulated by her wealth and privileged white society. Working part-time at a newspaper, she is drawn to Betty Jewel through her mysterious ad. With racial tension in the South brewing, the women forge a bond as deep as it is forbidden. With charm, humour, and unforgettable characters, The Sweetest Hallelujah is a remarkable tale about finding hope in a time of turmoil, and about the transcendent and transformative power of friendship. Elaine Hussey is a writer, actress, and musician who describes herself as -southern to the bone'. She lives in Mississippi, where her love of blues and admiration for the unsung heroes of her state's history served as inspiration for The Sweetest Hallelujah. Question: How does it feel to have your novel compared to The Help, The Secret Life of Bees and Fried Green Tomatoes? Elaine Hussey: I am delighted to be in the company of some of the best writers of Southern literary fiction! I have read and loved all three of those novels. 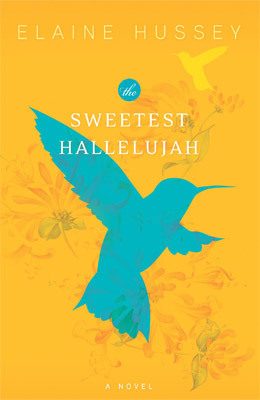 Question: What inspired the story of The Sweetest Hallelujah? Elaine Hussey: More than ten years ago I read a small newspaper story about a bedridden woman who was looking for someone to take her daughter shopping and to the movies, ordinary things she could no longer do. I began to extrapolate. What if the mother were dying? What if she lived in Shakerag in a time where her daughter's future appeared hopeless? What if the only person she could count on was a woman she had every reason to hate? The story started from that premise, and exploded into a hallelujah moment when Billie came to life, bringing with her a whole host of wonderful, colourful characters. Question: Was it difficult to write about where you live now, Mississippi, but in the 1950s? Elaine Hussey: Yes, it was difficult to portray my hometown during those brutal times. I did enormous amounts of research and reading, but my biggest challenge was to accurately capture 1955 Mississippi and still convey the deep love I have for my native South and its people. Question: There are several issues raised in this book. Was this deliberate or did the story evolve this way? Elaine Hussey: I started this story with the bare bones of the plot, a clear vision of the times, and a set of amazing characters who led me through the novel. The issues evolved organically. Perhaps my unconscious mind had a big plan for me all along, but I think the best part of writing is the mystery and surprise of it all. Elaine Hussey: My immediate response is no. But during the editing process I realized how much of myself I had put into Billie. When I was a child I earned the nickname Little Miss Nosey Listener because I was always eavesdropping on my older sister. And my own daddy bore a striking resemblance to Roy Rogers. Like Billie I loved movies and make believe, and I was probably the most disobedient little girl in Lee County. Question: How much of your inspiration, when writing, comes from real life and real people? Elaine Hussey: My stories spring from the imagination, but the muse is a trickster. Just when I'm satisfied that there has never been anyone, real or fictional, like Billie, I discover that I've put my childhood self on the page. Though I never deliberately create a character based on someone I know, I see each character through the lens of my own experiences, emotions, and beliefs.